1. Over time, copper develops a special lining that protects from rust and other potentially harmful elements including algae and fungi growth, so blockages, with their related cleaning and maintenance expenses, will be significantly reduced. 2. Aluminum gutters need to be maintained to avoid corrosion and dents, so cleaning them and caulking them regularly is important. And since aluminum expands and contracts with the temperature, they’re prone to cracks, which need to be repaired in order to avoid leaks. 3 .When it comes to affordability, vinyl tops the list because it’s lightweight and easy to install. Additional benefits include the fact that its color won’t fade, chip or crack over time. Vinyl can get brittle and snap in cold extremes, so it may not be the best option for homes in cold climates. 4. 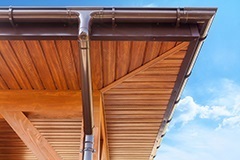 Steel ranks second when it comes to affordability, however, it’s important to note that it can rust in certain climates. Not only is it sturdy, but it can also hold a lot of weight, so sagging is less common.